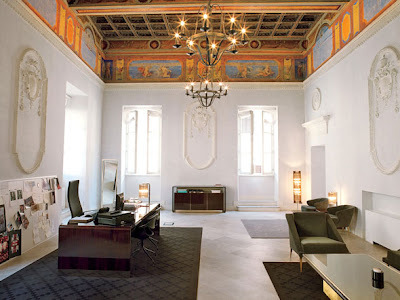 In 2009, Gucci moved their headquartes from Florence to Rome. The offices are located in a historic building on Via del Banco di Santo Spirito. The nine story palazzo was commissioned by Giulio Alberini, a wealthy merchant, and erected in 1515 and was designed by Raphael and his student Giulio Romano. Gucci head designer Frida Gianinni told W magazine that she found the "palazzo through a family friend, it had just undergone a historical renovation by architecture firm Studio Gigli. Inside, new bathrooms and lighting fixtures had been added, and the frescoes were painstakingly restored. Outside, the facade had been scoured of all that big-city smog residue." The Ministry of Arts and Culture rules created a few complications for the day to day work at Gucci. 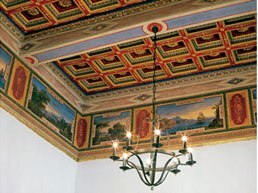 Soryboards and sketches that Giannini used to pin on her walls for inspiration have to lean on the floor due to the precious frescoes, “I can’t hang anything, let alone put lights up,” Giannini lamented. The frescoed ceiling at Gucci. Frida Giannini in her office. I love the brass standing mirror in the corner! 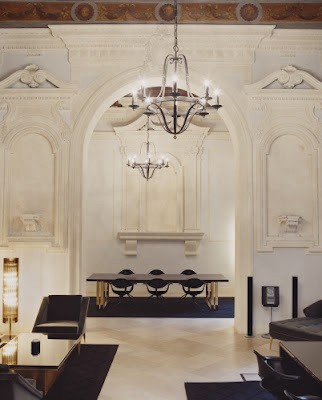 I don't care for contemporary furniture when it's housed in a sleek interior but I do like the look juxtaposed with mouldings, boiseries and architectural details. I always wonder if this is why Europeans love this type of furniture so much. It always seems to look better in their older buildings. 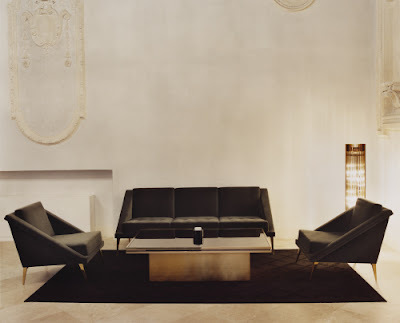 "For the decor, Giannini plucked furnishings from the blueprint she masterminded for the brand’s flagships in New York, Rome and Shanghai. Tables are crafted from shiny Indian rosewood, often bordered with rose gold–tinted brass; divans and chairs are made from mohair velvet; and smoky or clear glass inserts gussy up the doors." Frida Giannini was also just interviewed by James Franco for the March 2011 issue of Harper's Bazaar that includes a look into her home in Rome. After watching the Oscars last night, I do not understand his appeal but at least her house is interesting. I especially love the Fernand Leger painting behind them. 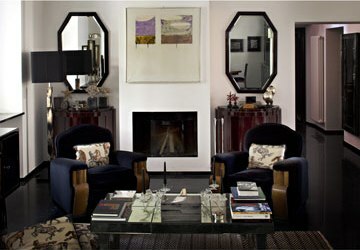 The living room was decorated with art-deco pieces. Frida sits in an Arne Jacobsen Egg Chair in her study. 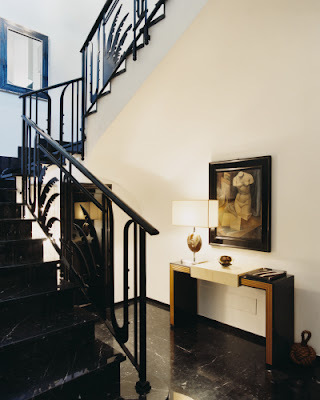 I love the railings along the stairs. I love the simplicity of Frida's home. Each piece of furniture becomes a work of art. 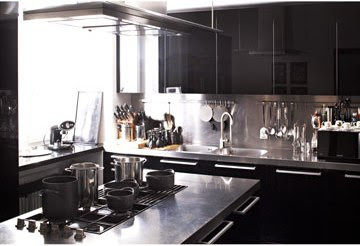 The kitchen is sleek and modern while the fur blanket softens the lines in the bedoom below. I know the Gucci office and Frida's home won't appeal to everyone but it really works for interiors in historic buildings in Rome. More than I can say about James Franco at the Oscars. The interior design of this house is amazing.I really love the color and lighting.Totally awesome. Painter and Decorator Wimbledon provide services other than just decorating aswell, so why not contact us to see what we could offer you.